Previous Dr. Burke, What Are Some Signs Of Eye Disorders? Next Dr. Burke, who are you? – Get to know a Grove, OK eye doctor. Dr. Burke, a Grove, OK eye doctor, answers a question about pink eye. Below is a transcript of the “Dr. Burke, Why Does My Child Have Pink Eye” video. Hi, I’m Dr. Robert Burke, and I’m here to answer your questions on pink eye. Pink eye, otherwise known as conjunctivitis, is a very common eye disease, especially in children. It comes in different forms, some of those forms are in the form of infectious, allergic, or chemical. When a child does come with viral conjunctivitis, we do see some watering of the eye, excess tearing, the child may experience a little gritty sensation in the eye as well, and he may actually have that pink discoloration of the white portion of the eye. It usually lasts for about a week to three weeks’ time period. Bacterial conjunctivitis demonstrates in a slightly different way than viral. It generally does have a mucous or a puss discharge coming from the eye. It doesn’t have necessarily the watering, but it does have the puss discharge. We also treat this; it takes about a weeks’ time for it to go away, but it needs to be treated with antibiotics. This deals with a lot of itching of the eye. You have the watering discharge and a lot of itching. The last category is chemical. It can cause a burning sensation to the eye. This type needs the eye flushed out with water, preferably distilled water or saline would be really good to flush out the eye, and you need to do it immediately and extensively. At all times if you suspect your child has pink eye, please bring him in to your eye doctor. 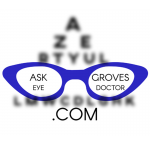 Thank you for your questions at AskGrovesEyeDoctor.com!